UFC 236 – Holloway’s patience or Poirier’s early persistence? A strikefest is probably a safe prediction for the UFC 236 main event between Dustin Poirier and Max Holloway, in what will be a rematch since the pair first clashed seven years ago. On that occasion, Poirier stopped Holloway by submission, although the bout was the latter’s UFC debut and only the fourth bout of his MMA career. Holloway’s progression has been rapid since, with the current UFC featherweight champion arguably the best that the 145lb weight class has ever seen. He’s on a run of 13 straight victories, including a pair of wins over the legendary Jose Aldo. ‘Blessed’ steps up to lightweight for the first time at UFC 236, but remains the 4/9 favourite to get his revenge on Poirier. The fact he won’t have to cut weight so much should technically make him both stronger and healthier here. The bout will crown an interim UFC lightweight champion, with Poirier 7/4 to triumph in what will be his first crack at UFC gold. Where both fighters excel is with the speed of their striking rate – both throw a strike approximately every seven seconds on average. However, they both tend to do this in different ways. 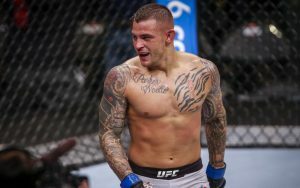 Poirier is a fast starter, looking to throw a significant number of strikes in the early rounds to see which bring success and which fail to land so successfully. This can be a sensible strategy as this is when his energy level is highest. As the rounds progress, ‘The Diamond’ slows down in terms of the volume of his strikes, but increases accuracy as he works out which punches and kicks are most effective. Holloway adapts a different strategy, often being relatively watchful in the earlier rounds to get a read on his opponent. He then steps up volume through the fight once he’s worked out a plan. Poirier punches harder, but will prioritise accuracy over volume in the later rounds, while Holloway prioritises volume over power to keep an opponent off guard and constantly on the retreat. Holloway possesses more variety in the striking department. He’s the more adept with his feet and because he’s more of a natural in terms of remaining in a fighting stance, he will tend to have more punch options. Poirier is much improved, but he can have a tendency to rush forward and get caught punching from a square position, which limits the variety of punches he can throw, especially when in range. He may also target backing Holloway up to the cage to look for a takedown, which would give him an opportunity to repeat the submission win. With Holloway being the taller man, taking the fight to the ground may help Poirier to negate this.